DECEMBER 2007 -- We have just finished our Annual Session. I feel that it was a very productive session. Much work was accomplished. The delegates diligently reviewed and acted upon forty-four resolutions submitted by Community Granges and sessions Committee’s. Six of these resolutions were sent to the National Grange for their consideration. I am not going to go over all of them in this report but there is one resolution I do want to discuss. Resolution Twenty-two Eliminating Inspections. Although this resolution was rejected, the Constitution and By-Laws Sessions Committee presented a Substitute Resolution. This Substitute Resolution, number Forty was adopted and it states “that the State Master review, revise and implement an inspection process that is conducive to the current needs of the membership”. When I became Master last year, in my address I said that I was not going to make drastic changes my first year. One of the things that has concerned me was the inspection process and I knew it could be better. I have made a decision on inspections and I am going to present it to the Deputies and everyone else who attends the Pink Sash Meeting on November 24 at Goodwill Grange Hall. As I write this column that hasn’t happened yet but as you read it, it will be common knowledge. As always the highlight of the session was the conferral of the sixth Degree on nineteen candidates. I know many of you went the extra mile to bring in new members this year and I truly appreciate that. I also know you have the desire and the drive to improve on this for next year. There is no magical way to do this. Everything we really want in life requires hard work and I know you are up to it. 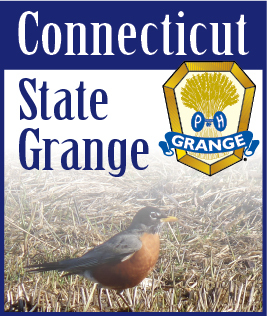 You have probably heard this before and you will hear it again but lets show the other States what the Northeast Granges are capable of. As Sister Marge and I are getting ready for the National Session, all of you are in our thoughts, and we wish you all a very Merry Christmas and all the best wishes for the coming New Year.